Our prospective clients often ask “What do I need to do on a regular basis to make the app successful?” They’re typically surprised to hear that CaredFor does the heavy lifting by providing content and technical support for the app, leaving clients with 3 tasks that can be done in less than 45 minutes per week. 1. Invite users - Send invitations weekly to patients discharging from the program. 2. Interact with user posts - Spend time reacting to and commenting on posts, as well as answering direct messages from users each week. Users want to feel heard and acknowledged. These small gestures can go a long way to cultivate community inside of the app. 3. Create supplemental posts - CaredFor posts content in the app on a weekly basis. We recommend that facilities add supplemental content to the stream. These posts can include announcements, inspirational posts, blog posts, articles, and additional resources. Your facility is probably producing assets that could be supplemental content on the app. 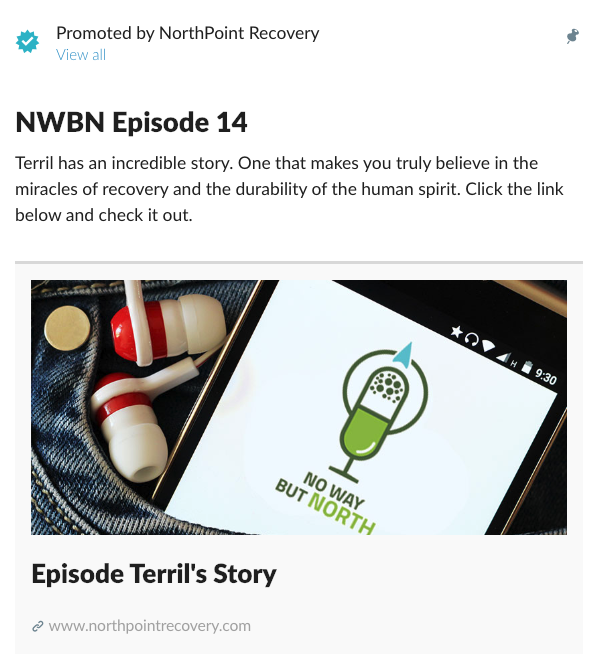 Our client, NorthPoint Recovery, has been producing a podcast called “No Way But North”, for several months. The podcast is hosted by Alumni Coordinator, Cooper Lyons, and is filled with inspiring stories of recovery, and features either a person seeking recovery or a professional in the field of addiction treatment. NorthPoint has begun posting the podcast in the app, adding to the always on digital library for their alumni. The outcome is that the alumni of NorthPoint are actively engaged in the app. Week after week we see posts, private messages, comments, and reactions which all serve to create a stable, safe recovery community. We’re proud to partner with Cooper and the whole team at NorthPoint Recovery.